Luckily, no one ever said pop stars had to be likeable: Steve Harley spends his four minutes of real stardom on an extended, bitter, glorious great sneer: whether he’s lashing out at ex bandmates, an ex lover, a current lover, the world, himself doesn’t really matter. The song’s built on pauses – between verses, between words – which coat its very real prettiness with a grease of spite, making the dancers stop dancing, the karaoke singers catch a breath, making sure Harley stays in perfect obsessive control of the record. But because “Make Me Smile” is such a great tune it has a jaunty use-value anyway – which extends Harley’s sneer onto the dum-dums who think this is romantic. (My sympathy, as usual, is with the dum-dums, even though for once their misreading doesn’t improve the song). “Make Me Smile” could overheat – stuffed as it is with different hooks and topped with a smothering organ line – but it still has a slicing force and clarity, thanks to Harley’s outstanding performance. Two highlights, almost at random: his epically curdled “Mother – EEUUURTH”, and the contrasting wistful vulnerability on the chorus’ “I’ll do what you want” – somewhere inside, maybe he still wishes that was true. Heavens, are we here already? It hardly seems five minutes ago! But it is a bit of a cracker, isn’t it? Pure, infectious pop that seeps into every crack and really does make you smile, well it makes me smile anyway, and it has enough hints of other stuff – reminds me irresistibly of Dylan, for some reason (give me a while and I might even think of a specific Dylan song but it won’t come right now. Something about the sneery, nasal tone anyway. No pretentions to anything other than having a good time, and being a conduit for all the little pissed-off-about-life-the-universe-everything things that infect everybody’s life. And Mr Harley ios enjoying himself. He still is, isn’t he, doing the Where Are They Now tours? One darker note – for me, it goes hand-in-hand with the Moorgate Tube Disaster, a kick in the teeth that came at the end of a good night out. Somehow at some point ten to fifteen years ago this song became quite irritating to me but I’m not quite sure why. A similar thing happened with ‘Lola’ though that was recently slightly improved via it’s inclusion in Morley’s I Wub Pop docu (tho it was Suggs as it’s chief rep). Maybe this would’ve done the trick for me and MMS(CUASM) too. I like the music and the relative richness of the production though so maybe it’s just a combination of the character of the vocal and the projection of the song as pub pop anthem, curse of Hornby etc. This may not be fair or accurate but there you go! I may have danced to it once tho not sure I’d want to again but at least the more I think about it now the more I appreciate it’s good points. This was actually my experience too Steve – Harley has been a beneficiary of the delay in writing the entry, in that I fully expected him to get a 6 or 7 owing to being vaguely irritating, but more careful attention has revealed the pearl amidst the grit, or somethimg. I have quite a lot of time for Steve Harley in the right circumstances. Until Radio 2 opted to move the programme to beyond midnight in order to accommodate the more urgent and key likes of Jerry Hall documentaries, his Sounds Of The Seventies show was required listening; cynical but loving, amused but realistic, lyrical (his description of Dylan’s “Changing Of The Guard” was poetic) but earthy, egotistical (he didn’t refrain from playing many of his own tracks) but open – and he knows his Judee Sill. In addition, the first two albums by the group Cockney Rebel – The Human Menagarie and Psychomodo – are as good and adventurous a pair of opening albums from any British band that side of Crocodiles and Heaven Up Here. You may marvel that the state of the record industry was so enriched at the time that a three-chord busker’s ode – “Sebastian” which Harley must have played at every tube station in central London – could be expanded to a devastating, lavishly orchestrated six-minute-plus elegy. Or the seldom visited lair of Psychomodo in general, with its prophetic hints of Talking Heads, Magazine (Devoto was Harley’s real heir – that attractive, compulsive dominion of certainty!) and even PiL. I’m afraid that I only get this one in theory. I think that my problem is the only emotion that I sense from it is a rather vapid misanthropy. With songs about being unpleasant, there are two responses that I can have which work “Ha! That’s brilliant!” (‘Positively 4th Street’ or ‘Unhappy Birthday’, say) or “I feel like that, too!” (‘Psycho Killer’ or I Want You’ – the Costello one). With this, I just think “What a tiresome man you are!”, interesting arrangement notwithstanding. I did enjoy The Wedding Present doing this on Top Of The Pops, though. And I’d happily concede that the Duran Duran version is inferior. I remember reading that his religious faith has helped him through the wilderness years when younger and less talented people have enjoyed greater success than he. I have known (and loved) this song for years and always assumed it was romantic! I don’t think I ever listened to the lyrics though, because with those sha-la-las you don’t need to. The Wedding Present version, however, was genius, especially the Dinosaur Jr-style ending, and sadly their TOTP performance of same doesn’t seem to have made it to YouTube yet but it’s a classic, right from the second they jump through the huge photo of themselves and Gedge does his kung fu fighting bits of business. I’m not sure why this track in particular became a staple of oldies radio – it seems to have been treated with no more nor less reverence than other above-average 70s number ones until it was used in “The Full Monty” soundtrack, or am I mistaken? I like the hooks, the silences and the Spanish guitar bit work well, but somehow, perhaps due to the overarching tone of cynicism, this one fails to make the emotional connection with me that a really great song should. It’s still better than 80% of the songs on here though. Mind you he was apparently an arrogant so-and-so. If you want to, you’ll find Steve Harley on Eamonn Holmes’ Saturday morning Radio 5 show as the resident racing tipster. The fact that a horse called Cockney Rebel has been winning a good few races recently hadn’t escaped him. I seem to recall it was also used for a Carlsberg TV ad in the early nineties, and indeed even briefly re-entered the chart as a result. Heh, I actually know Steve Harley, and your description was quite spot on. Kudos! Is it just me, or is it impossible to play and sing this song without veering into vic reeves club singer vocals? Can’t say that I’ve ever thought of it in that way; however, on looking through the chart the week this went to number one there are many club singer-friendly classics, including My Eyes Adored You, I’m Stone In Love With You, Help Me Make It Through The Night, Never Can Say Goodbye, Mandy (Barry making his UK chart debut), Streets Of London and Y Viva Espana. And also the week’s highest new entry at 23 which would go on to become the next number one. Meanwhile, the US #1s have been “Fire” by The Ohio Players and “You’re No Good” by Linda Ronstadt and a song I am surprised isn’t going to appear here, as it’s British…and I (at least) like it a lot more than this one. Back in the 80s I heard this on CFNY – the DJs there always seemed to be very happy to play it, and I could never figure out why. There’s something passive-aggressive about it, like if a cat could sing. The Brit one being the splendid “Pick Up The Pieces” by Dundee’s second finest, the Average White Band (#6 in the UK but, unsurprisingly, a number one in Scotland). I keep meaning to ask you, Marcello, how you know what was #1 in Scotland. Were there separate published charts for Scotland in the 70s? Indeed, does this still happen? I’ve nothing to add to the positive vibes about “Make Me Smile (Come Up And See Me)” btw – 9 seems just right. Tam Ferrie (and later Peter Easton) did a countdown of the Scottish Top 40 every Friday night on BBC Radio Scotland. Printed copies were also posted up in Menzies, Woolworths and suchlike and the woman in Hamilton Woolworths always used to give me a copy of the previous week’s chart once they’d finished with it (because I went there every week to pick up that week’s new entries). For Glasgow/Clyde Valley sales we also had the Radio Clyde Tartan Thirty which Richard Park counted down every Thursday lunchtime. Top dollar. Regulars on the thread might recall me mentioning how my older brother introduced me to Neil Young and Leonard Cohen. Or perhaps not! With “Make Me Smile” I turned the tables on big bruv. I can honestly claim to have bought this single prior to it charting and playing it over and over. My brother walked in on me and was instantly captivated. It wasn’t just the Spanish guitar, it was the whole package. He was right, of course, and unlike the record it replaced at the top, it stands the test of time in spades. A brilliant body of work for all seasons and Mr Harley now an erudite Radio Two presenter. I’d be proud to have a beer with the guy. A great, great record. Gosh, I’m on a happy bunny roll with this. February ’75 would have been the run-up to O Grades, and with this and Pilot I must have been in a extra-positive, can-do sort of mindset, since both remain songs I’m pleased to listen to more than three decades later. My younger brother, with whom I have nothing in common, loved this (he was the one who bought the 7″), and perhaps I’m partly nostalgic for a very rare flash of consensus between us, something that if Scots weren’t quite so grudging with their feelings, could have been bonding. Right from the intro it just grabbed us – the mannered delivery (the ‘say’ that becomes ‘sayigh”, those manipulative pauses, the recycling of the Mae West catchphrase, the theatrically arcane language (“Maybe you’ll tarry for a whi-yill?”) and that deliciously exotic guitar solo that brought that promise of future summer and sunshine that chimes with the way the nights get longer around this time of year. Perhaps it was just the antidote to my characteristic introspection but, however barbed it was for his sometime band mates, for me, in 1975, this did what it said on the tin. I suspect that either (a) he started writing a song of vengeance against his former bandmates but got rather taken with the tune and rhythm and the song went elsewhere, or (b) he had a song about a runaway lover on the stocks and adapted it slightly here and there and later crowed about his triumph in interviews once it had gone to #1 (which he may have felt was his real triumph). I find this an irresistible tune, sung with a snarl but one that sounds as much hurt as angry. The Spanish guitar is rather witty against the very studio-bound confection of the arrangement, a little breath of freedom in amongst the fierce onward rhythm, the tightly-played little scale at the beginning. And, though he holds the notes rather insecurely in places, it’s a tremendously coherent vocal, a little world of pop emotion. After the promising skewed glam of Judy Teen & gloriously fabulous Mr Soft this came as something of a disappointment to me. Which probably says more about me than it does of Mr Harley as it obviously fared better in the charts than either of them. Despite my initial reservations it was still head & shoulders above most of what surrounded it in the charts and I did eventually come to acknowledge it for the classic song it is. The intro was supposedly devised from one of the band warming up although of course that could be a Harleyism. Harley’s sneering vocals are great thoughout and despite lacking the inventiveness of the previous version of Cockney Rebel the band produce a solid enough performance. So what does this have in common with the previous no1 ? Well yes they were both on the lovely red & brown EMI label but also, as aluded to in the previous No1 comments, members of both Pilot & Cockney Rebel went on to form the basis of the KT Bush Band who featured on her early albums and on her one & only tour. Sometimes I get these and sometimes I really don’t. 9? Really? I just listened to it for the third or fourth time, and as with each of the other times (occasional since this entry first came up) I feel no desire to hear it again. There’s a couple of good parts, mostly to do with knocking off Dylan (the “blue eyes, blue eyes” is nice) but overall it’s sort of leaden and sluggish, a little too much mid-range to the mix or something. Clearly I’m in the minority here but it’s just dull to me. Do you have to be British or something? I’m not British, and I like it quite a bit. It helps, perhaps, that I’ve always mentally categorized it as glam, which makes the snarling theatricality of it part of the genre, rather than part of the performance. Or something like that. I have to go ahead and confess here that this has grown on me tremendously – a 9 still seems way out of proportion, but this is a great performance and great recording, as good a sneering record as anything by the Pistols. 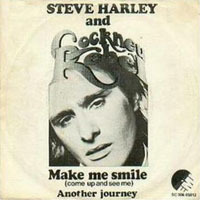 Steve Harley and the Cockney Rebels, make me smile, fantastic recording, much better than the rubbish about today. Great song. Don’t agree about the Duran Duran version (Live – Hammersmith ’82) being inferior though. Very different interpretation, yes, but rather wonderful as well. It’s always been fashionable to do them down, but on this occasion, they really don’t deserve it. What the hell are you on about? Supposed indeed. Have you talked with the other band members lately? It wasn’t about money, it was about creative control. Steve asked them if he could stay the song writer for one more album and 3 didn’t want that 1 was okay with it. It’s pretty simple. Steve was 23 freaking years old when the band broke up. What were you doing and how were you acting when you were that age? He didn’t control their wages. I’m surprised at some of the negative comments from some of the posters here. Mick Rock said it best when he said Steve was a sensitive man with a very big heart, some of you act like this one song/story defines him. He has countless better, deeper more beautiful songs than this one. “Red Is A Mean, Mean Colour” not being one of them. Did he also record Blue Is The Colour? Possibly as a duet with Lynsey De Paul? Has anyone pointed out that his real name is Steve Nice? Given his rep you can see why he changed it. Is this the slowest day ever on Popular??? Slowest month more like. Still, I can hardly talk – I did manage to put TPL #109 to bed but you’re going to have to wait another fortnight for #110. Life commitments innit. Must say Marcello I thought your treatment of Machine Head was particularly good. Really want to listen to it now (which I gather is your aim). First time hearing this and I like it a lot. It freely acknowledges its debt to “Blonde on Blonde” era Dylan, which is utterly fine with me. I love this song dearly, but I must admit I didn’t realise quite how good it is until I heard the Wedding Present version. There’s an odd combination of theatrical grotesquerie and confessional angst about CR’s previous singles (I haven’t heard the albums) – as if to say, “Come into my strange and beautiful world… please, *somebody* come into my world…” It’s not as pronounced on this single, but it is there – and doing that in the confines of what’s by anyone’s standards a radio-friendly unit-shifter is quite impressive. My theory, which is mine, is that the song’s addressed to a male friend who’s freaked out and run away when the singer made a pass at him. Admittedly, this doesn’t fit very much of the song – but the bits it does fit, it fits very well indeed. #40 You do realise that the Wedding Present’s version is Steve Harley’s favourite cover of it? I’m sure you do..
#10 and others: I see that the TOTP performance has made it onto the 4 disc edition (3CD +1DVD) of Seamonsters.